OrangeCD Catalog is the comprehensive music database program for cataloging music in any format: CD, DVD, MP3, iTunes, OGG, FLAC, WMA files, and even LPs and tapes. 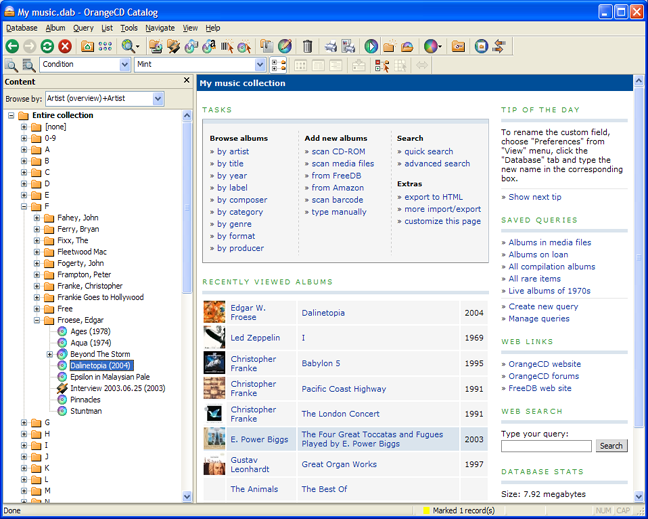 OrangeCD Catalog can manage classical music as well as pop music. To add a new CD to the database, you just need to insert it in your computer, and OrangeCD will download all information from Internet. You can use resulting database for browsing, searching, and publishing on the web. OrangeCD Catalog's resulting database can be used for browsing, searching, printing or exporting to any of the supported formats. Now you can quickly check if you own specific album or song, find its exact location on CD shelf, print CD changer index sheet or calculate your total CD library value for insurance. You can create web pages with the list of all your albums and upload them to your website. The feel and look of the web pages is defined by templates and can be easily customized. You don't even have to run your own website to upload your music list online. In OrangeCD Catalog, you can publish your music collection catalog on Racks and Tags, share it with friends, and browse your music inventory from work or school computer. Qweas is providing links to OrangeCD Suite 6.4.5 as a courtesy, and makes no representations regarding OrangeCD Suite or any other applications or any information related thereto. Any questions, complaints or claims regarding this application OrangeCD Suite 6.4.5 must be directed to the appropriate software vendor. You may click the publisher link of OrangeCD Suite on the top of this page to get more details about the vendor.